Equip is our weekly meeting where the whole of the CU comes together to be equipped to live and speak for Jesus. What happens at Equip? 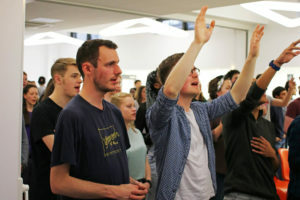 Every Friday is different, but typically, a guest speaker teaches us from the Bible, we sing songs of worship together, spend time praying for the for the spread of the gospel on campus and all over the world, and hear about all that has been going on within the CU and how we can be involved. Talks? But I’ve had a week of lectures! Fear not! The talks are aimed at helping us think practically about how we can live for Jesus and tell others about him in our context as students. There will be time in small groups to discuss and pray over what we’ve heard, how we’ve been challenged and how we can help and build each other up. Our meetings are fun, engaging and enjoyable as we meet together, enjoy fellowship and worship God. Everyone is welcome, especially non-Christians, and it’s a great way to meet and socialise with the rest of the CU. After Equip, we stick around to eat cake and chat, so don’t head straight home at 9pm, please stay and join us! We generally move on to Mooch, the SU bar, afterwards – so join us over a drink to carry on catching up!